Compared to last week, this week we saw much progress. 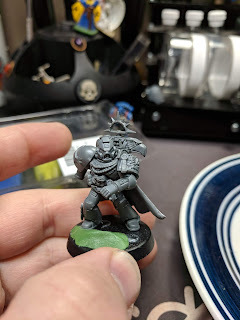 On Wednesday night I built a Watch Captain and a squad of 5 Vanguard Veterans for my upcoming Deathwatch army. 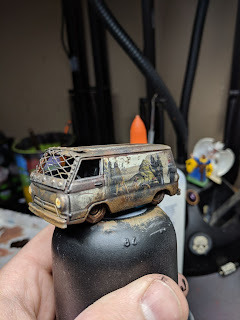 Thursday night, I found a really sweet van and did a super quick weathering job on it for Gaslands. Saturday I started playing around with building a custom Watch Master for the Deathwatch and then on Sunday morning I did some conversion work on an old metal space marine and made him into a Watch Sargent or possible Watch Captain for the Deathwatch as well. Monday night I converted the 25th Anniversary Space Marine into a Deathwatch marine as well. Finally on Monday I started on the Death Company Vanguard Veterans for the commission I'm working on for my buddy Mark and started painting one of my Deathwatch conversions while waiting for washes on them to dry. 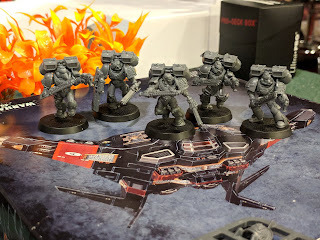 Ever since I started planning on playing Deathwatch, I had an idea for a HQ unit that was a jump pack wearing, hammer and shield fighter. 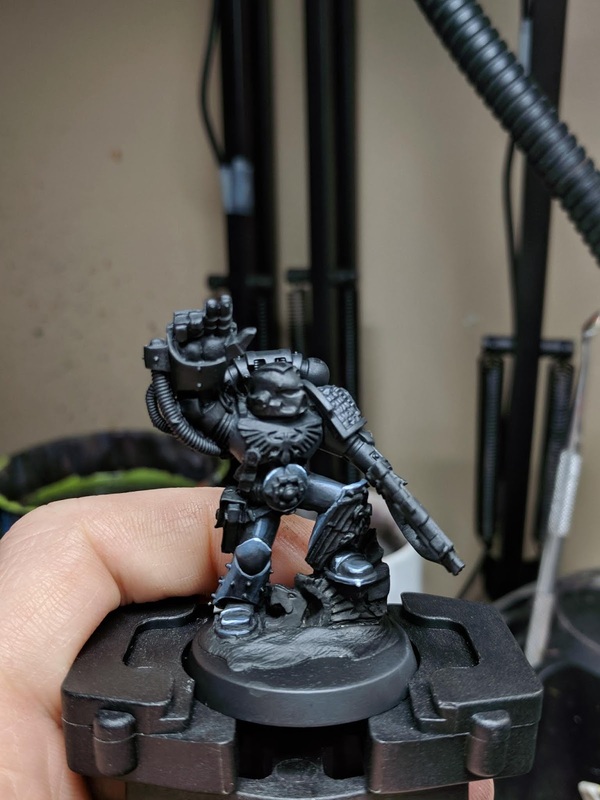 This guy was tossed together using pieces of the Deathwatch Vanguard Veterans box, the shield came from the Deathwatch Kill Team box and the helm and shoulder pad are originally from the Deathwatch upgrade sprue. I am pretty happy with the end result and the pose came out pretty close to how I had envisioned him, so that's a good thing. 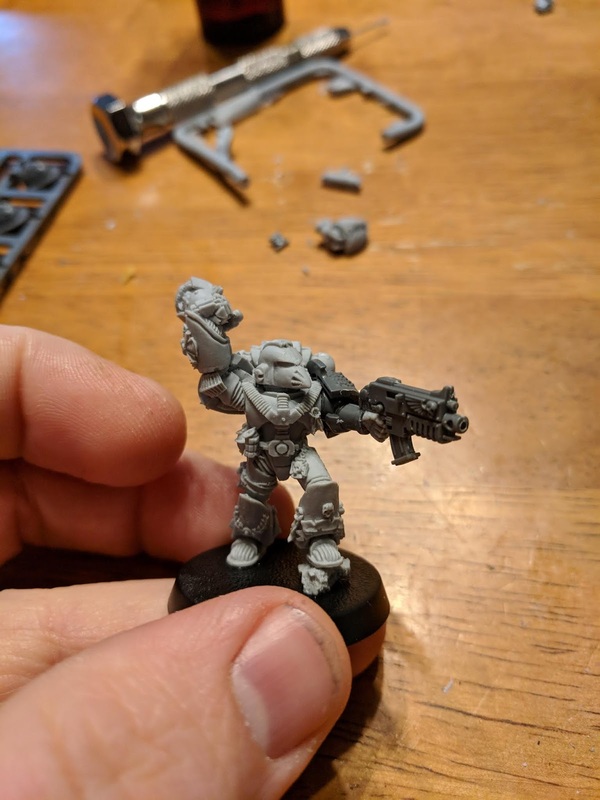 The same night that I assembled the Watch Captain, I also put together a squad of Vanguard Veterans with bolt pistols and chainswords. I really like how the dual sword Sargent looks and the one with the beak helmet. They still need barrels drilled, but that will wait for the time being. This army is all about customizing as much as I can and the Watch Master is no exception. The official miniature is OK, but he seems so static. I wanted a model that looked like he was going to jump right into the fray. I took inspiration for this pose, thanks to my love of Romance of the Three Kingdoms era spear fighters and Kirito's battle pose from Sword Art Online. At the moment, he's missing the Guardian Spear. But that is coming thanks to my friend Dusty, who was kind enough to donate one to the cause. I want to do a bit of green stuff work to him yet. But I like where he's going so far. This old metal boy was purchased years ago. He was a web exclusive model, and if i remember, you needed to spend a certain amount to get him for free. He was originally painted up as an Ultramarine, but a few years ago I stripped the paint off of him, meaning to put him in an Imperial Fists army. That never happened and in the time between I lost his original backpack. After a bit of debate, I decided that he needed a new lease on life. So I cut apart his boltgun arm and reposed it with plastic bits and then gave him a Deathwatch shoulder pad. 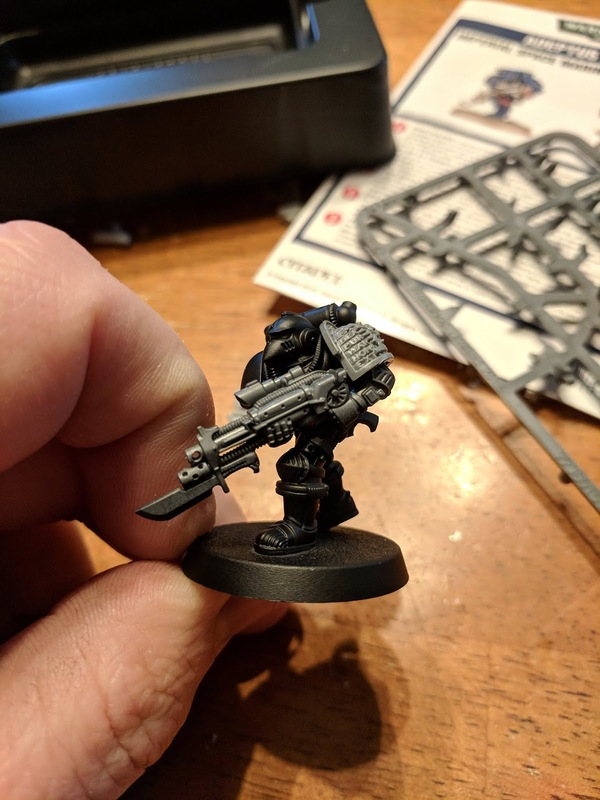 He's also the first Deathwatch mini that I'm painting, so he's basically my test model. I like how the black armor is turning out so far and can't wait to see it finished, because right now it looks a bit grey. But once the surrounding areas are finished, it will definitely read as black. I'm recording the process of painting him as well. He'll appear on my YouTube channel's Let's Paint series somewhere down the line. With the web exclusive limited edition marine converted, I decided that I might as well do the same with my other limited edition Marines. This fella was released for the 25th anniversary of Warhammer 40,000 and I tracked one down last year after I got my hands on the 30th Anniversary Marine. Anyway, I decided that LE minis are right at home in the Deathwatch and that I'd rework this guy to hold a boltgun and plop a DW shoulder pad on him. It took a bit of work to make the boltgun work though, as I don't have any that are left handed. Also the elbow pad is wrong. I need to play with some green stuff and make it look somewhat passable. 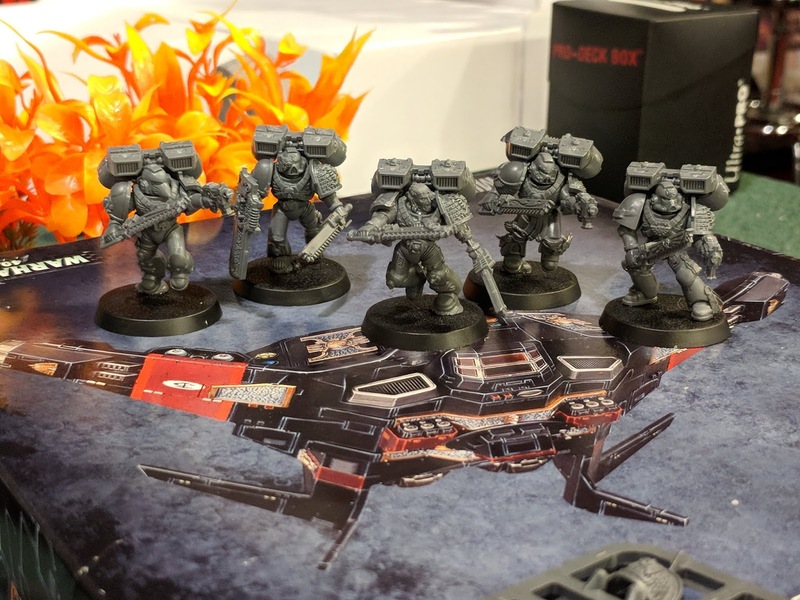 The 30th Anniversary Imperial Space Marine isn't technically available to the Deathwatch. But, he is in the Index: Imperial I. So, with a bit of detachment shenanigans I was able to add him into my list. This fella is a single model and unique. He can't be used more than once in an army list. 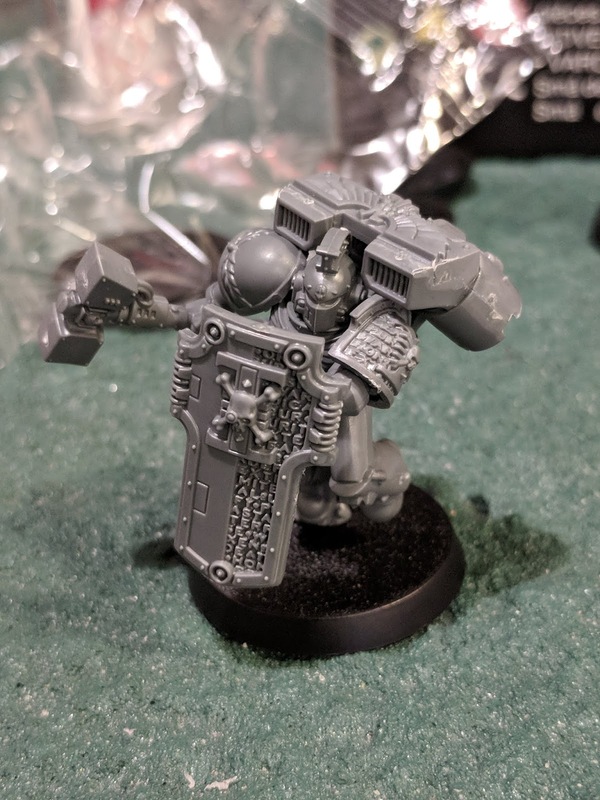 This alone makes me wonder why he wouldn't have been included in the Deathwatch at all. The way I understand it, he's not in the Space Marines codex either due to the fact that he's a limited edition miniature. But he's fully usable in game and if you wanted to you could convert your own to play him you can, especially in friendly games. Unfortunately, it would seem that I forgot to take pictures of these fellas. So I'll have to get that added in later tonight. We were wandering around the local supermarket and getting pictures printed, when we wandered into the toys section and started looking at cars for Gaslands. I happened to notice a set of Star Wars themed cars featuring Ralph Mcquarrie concept artwork and one of them was a Dodge A100 that had a Rancor on the side of it. When I got home, I started playing with plasticard and then couldn't resist getting it weathered. After about 30 minutes of sponges and washes, it was finshed! I really love how it came out and it got a lot of compliments on Twitter and Instagram. The success of it made me track down the rest of them and soon I'll have a fully painted crew for Gaslands. That's it for now. It was a busy week for hobby, which felt great! 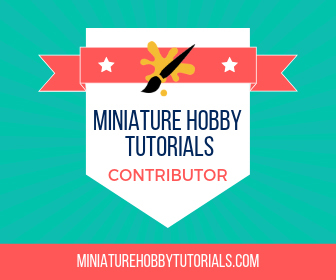 I've been slacking a bit on the hobby time lately, but I can feel the mojo flowing again. Until next time, you can catch all my progress as it happens on Twitter and Instagram.